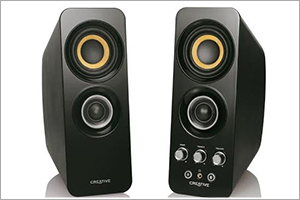 Creative Technology Ltd introduced its new flagship T30 Wireless Signature Series 2.0 speaker system. This new high-performance speaker features Bluetooth and Near Field Communication (NFC) wireless connectivity to enhance ease-of-use for mobile device, PC and Mac users. The new wireless line-up rides on Creative’s legacy of producing high quality wired desktop speakers that produce powerful and precise audio. The popular wired Creative GigaWorks T3 and T20 – the technology of which can be found in the new T30 Wireless – won numerous awards and sterling reviews for their audio performance and value for money. The Creative T30 Wireless 2.0 speaker system is crafted following a two-driver design methodology – with a dedicated tweeter and driver. It features custom-made silk dome tweeters for silky smooth highs, woven glass fiber cone drivers that produce natural and accurate, full bodied midrange and Creative BasXport® technology that delivers high output bass. Ideal for use with mobile devices, Mac or PC, the Creative T30 Wireless features Bluetooth and NFC wireless connectivity. It sounds as good as the wired speakers that inspired it thanks to aptX® high-definition audio codecs. An additional Line-in option enables wired connection to audio devices and a dedicated jack for headphones allows private listening. The Creative T30 Wireless Signature Series speaker system is available in the market at Jumbo Retail and online platforms such as Flipkart. The speaker has been launched at the MRP of INR 13,999 across India, , distributed by Creative Peripherals and Distribution Pvt. Ltd.